Skeeters: There’s an app for that! Got mosquitoes? There’s an app for that! My Droid app SEEMS to work: It’s called Favorite Frequencies, though there are many more out there just like it. It makes a very high pitched screamy noise we can’t hear, but that bugs seem to hate. We can sit on the porch dring our ice tea, listening to music, reading, etc., without getting chewed up. And it’s free! Hi machineelf, welcome back! 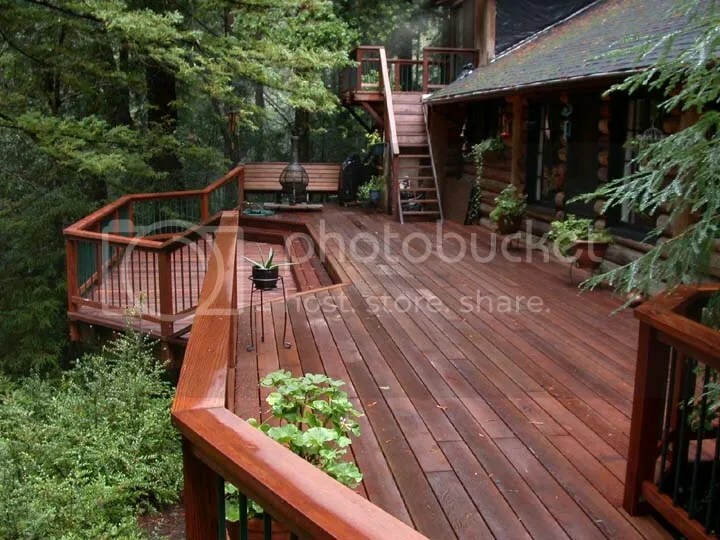 Lots of trees and underbrush attract skeeters, these folks could afford to cut themselves some space between the deck and the forest and still leave plenty for privacy, donchathink? At least, that’s what I’d do. Spooky’s porch looks a lot like this and cutting down a few trees is definitely in the landscaping master plan. Hi Pinky, welcome back yourself! Can’t say that I’ve ever heard of trees and underbrush being a mosquito problem. Standing water, yes. Maybe I’m a big softee when it comes to trees, though–I hate seeing them cut down. We live on several wooded acres out in the country, and I think having lots of bats and insect-eating birds around helps a lot, too. And they need trees to live in, right? I too have a soft spot for trees, they’re kind of like people to me, even have personalities. I also like bats, they’re magic mice with wings! But underbrush attracts the mosquitoes, yes unfortunately. It’s the shade – it increases the moisture, even to the point where mold will grow on the roof and sides of the house. In NJ we have “scrub trees” – I dont’ call them garbage trees but many here do. The white pines have adapted to shore life and help keep the topsoil from sliding into the ocean by growing very fast. Unfortunately they spit a lot of sap and routinely drop branches and are kind of a drag to have around the yard. I won’t miss them. Neither will I miss the trees that lean toward our house, begging for the next tropical storm to land on our roof. Once those go, we’ll have a lot more sunshine and fewer bugs. And we’ll still have a lot of trees, deciduous and evergreen and flowering, to keep the topsoil in place.